“Cold, vulnerable people arrive in Calais and are rounded up and taken to the detention centre by waiting police. The detention centre is overcrowded, housing 120 people at anyone time, and visiting is obstructed at every level. If released, people are sometimes thrown out of a van onto the verge of the A16, or deported to a Dublin country, or ordered to leave French territory. But to where and with what? Those who choose to stay hide in parks and wasteland with no shelter, or find a smugglers camp in the shadows. Continuous games of hide and seek are played by the police, detention and deportation the prize. A lucky few find sanctuary in a house, but it can be against French law to aid the refugees, so again they hide. The hosts risk punishment and ostracism from a hostile community. 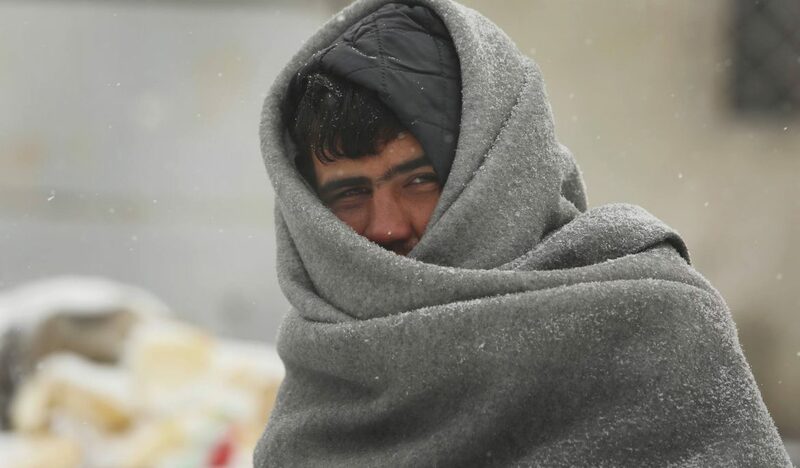 Many refugees go to Paris, where they are forced to sleep sitting up on the streets in the freezing cold, waiting, as only 40 a day can get into the Hildago camp, and then for 10 days only. They must claim asylum if they want to keep a roof over their heads, but there is no guarantee asylum will be granted. This promised temporary accommodation comes in the form of bleak holding pens in the city, 100 people in a gymnasium or barracks, with little to warm or feed them. Again they must leave, only to be hunted through the streets of Paris, there is nowhere to rest. So back to Calais, a continuous forced movement of people – invisible, unless you know it is there.